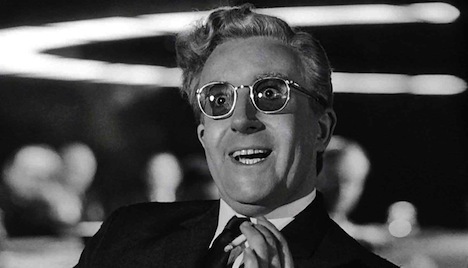 Did Syria’s Assad regime have a Dr. Strangelove moment? January 2014 marks the 50th anniversary of the release of Stanley Kubrick’s dark nuclear war comedy Dr Strangelove or: How I Learned to Stop Worrying and Love the Bomb. It’s the charming tale of U.S. general Jack Ripper (Get it!? ), who’s gone completely off his rocker and launches the world into a nuclear crisis as the United States and the Soviet Union bumble to stop the fallout from the chain of events that the wayward general sets in place. In the U.S. war room, the meek U.S. president (played brilliantly by Peter Sellers) asks another general, ‘Buck’ Turgidson, why a renegade general somehow found a way to order the use of nuclear weapons outside the chain of command, given that the U.S. president is the only one authorized to launch a nuclear attack. It’s starting to look like last week’s horrific chemical warfare attack was a case of someone in the regime of Syrian president Bashar al-Assad exceeding his authority as well. Did Syria have a ‘Dr. Strangelove’ moment? And if so, how should the international community ‘punish’ the Assad regime if it turns out that a rogue pro-Assad commander launched the attack and not Assad or his top guard? Is there some sort of negligence per se standard for crimes against humanity? Even as British prime minister David Cameron is backing down from the urgency of an immediate Syria strike (at least until the United Nations finishes its initial assessment of the chemical attack in the days ahead) and French president François Hollande is emphasizing a political solution to Syria, the case for an overhasty, unilateral military response from the United States is falling apart in favor of a multilateral, evidence-based approach that would otherwise avoid further internationalizing the two-year, sectarian Syrian conflict. Last Wednesday, in the hours after a horrific chemical attack east of Damascus, an official at the Syrian Ministry of Defense exchanged panicked phone calls with a leader of a chemical weapons unit, demanding answers for a nerve agent strike that killed more than 1,000 people. Those conversations were overheard by U.S. intelligence services, The Cable has learned. And that is the major reason why American officials now say they’re certain that the attacks were the work of the Bashar al-Assad regime — and why the U.S. military is likely to attack that regime in a matter of days. Of course, that calls into question the strident and unequivocal stance of many U.S. and European officials over the weekend and earlier this week, including British foreign minister William Hague and U.S. secretary of state John Kerry. A report by the Office of the Director for National Intelligence outlining that evidence against Syria includes a few key caveats – including acknowledging that the U.S. intelligence community no longer has the certainty it did six months ago of where the regime’s chemical weapons are stored, nor does it have proof Assad ordered chemical weapons use, according to two intelligence officials and two more U.S. officials. But one senior U.S. official who read the report said Thursday that despite those caveats, the report assesses with “high confidence” that the Syrian government was responsible…. The official conceded that there is no proof listed in the report tying Assad personally to ordering the attack, but the official also said there was no mention in the report of the possibility that a rogue element could have been responsible. That’s certainly very consistent with Shachtman’s report, and it makes intuitive sense. With Assad generally winning the war and reclaiming ground against the disparate opposition, it makes no sense for Assad to draw the ire of the world by launching chemical warfare on civilians. The timing, moreover, has always been suspicious given that United Nations chemical weapons inspectors were sitting in a Damascus hotel when the chemical attack occurred. We know that the Assad regime has certain access to chemical weapons, and while there’s a possibility that some weapons have fallen into the hands of anti-Assad rebels, this explanation is certainly less harrowing than the alternative possibility that radical opposition elements launched a toxic chemical attack in the hopes of framing Assad and drawing the international community against him. The JIC acknowledged that some of its assessment was based on “open source” evidence such as testimony from victims, doctors and video footage. But in a separate letter to Cameron the JIC chairman, Jon Day, said he had seen “highly sensitive” unpublished intelligence that supported their view that the regime had launched the attacks to clear the opposition from strategic parts of Damascus. In one passage the JIC appears to weaken its own conclusions by noting that there was “no obvious political or military trigger for regime use of CW on an apparently larger scale now” – given the presence of the UN inspectors. It wrote that permission to authorise CW had “probably been delegated” by Assad to “senior regime commanders, such as [*]”. It added: “But any deliberate change in the scale and nature of use would require his authorisation.” That language suggests the possibility, as reported in the US, of unauthorised or accidental use of CW munitions.